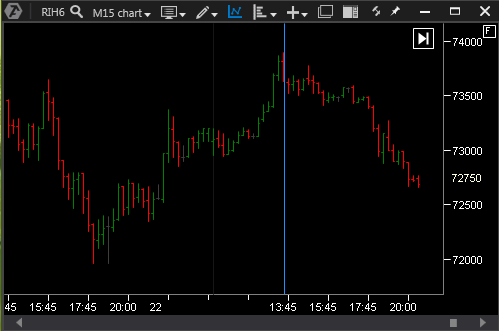 he ATAS platform has the function of adding various graphical objects on a chart. Click on the icon in the chart bar menu. * By default, hotkey settings have been already set in the platform, but you can change them if necessary. More information about this is available here. Next, a window that displays all the available elements will open. Description of drawing objects functions. * The functions described below are applicable to all the elements of drawing objects. 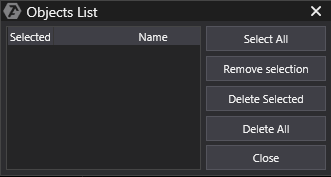 Delete Selected - remove only the selected drawing objects in the chart. Delete All - remove all the drawing objects in the chart. Select All - select all the drawing objects in the chart. Copy All - copy all the drawing objects in the chart. Copy Selected - copy only the selected drawing objects in the chart. Paste - past only the copied objects in the chart. Undo - undo the last action. Editing the elements of drawing objects - to edit the desired element of drawing objects requires, it must be selected by left-clicking once on the selected element. 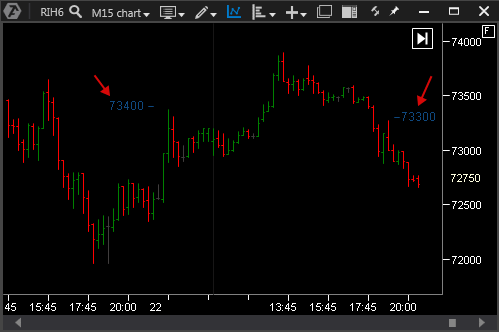 After that, it will be possible to increase/decrease and move the element to any area of the chart and to open visual configuration of the element by right-clicking the mouse. * Most of the visual settings such as color, style, width, and display of the object behind the chart are the same for all the elements; therefore, the descriptions of visual settings for the elements contain only description of the settings that this particular element has. To save the default settings, use the Save As Default button. To return to the default settings, use the Reset button. To remove an element, use the Remove button. To apply the settings click the OK button. 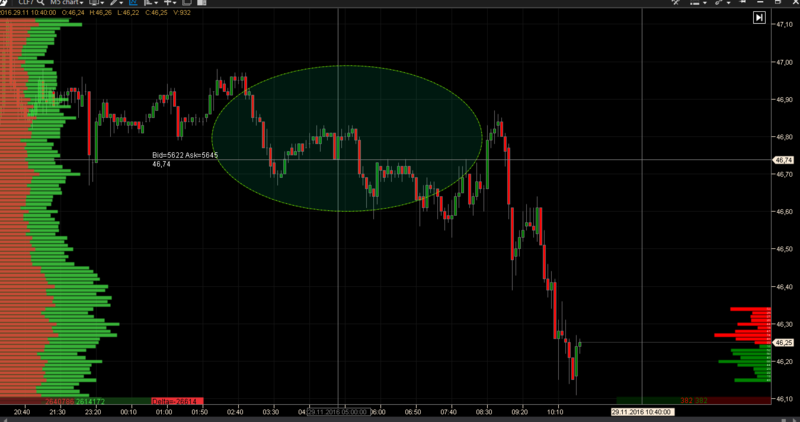 It is used to mark the trend movements on the chart. To draw a trend line on the chart, it is necessary to left-click once on the chart at the starting point, move the mouse cursor to the end point, and left-click again to complete the drawing. Ray - this feature allows extending the trend line. StartLineAsArrow - the start of the line as an arrow. It is used to select certain sections of the chart. To build the line, select the desired area ofthe chart and left-click. After that, a vertical line will appear on the chart. 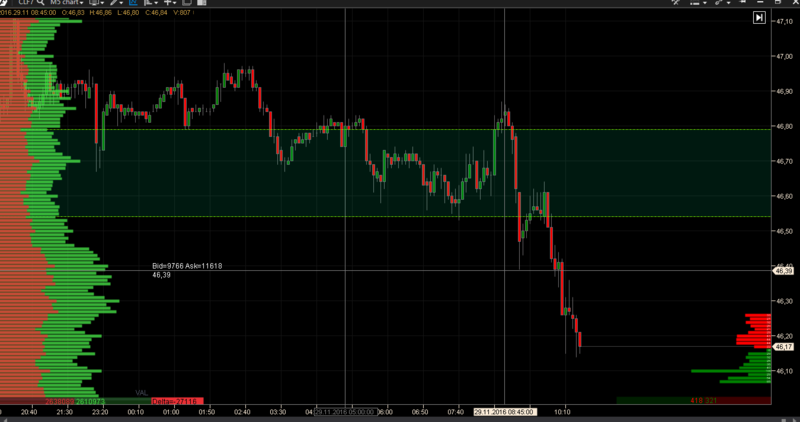 It is used to indicate support and resistance levels. 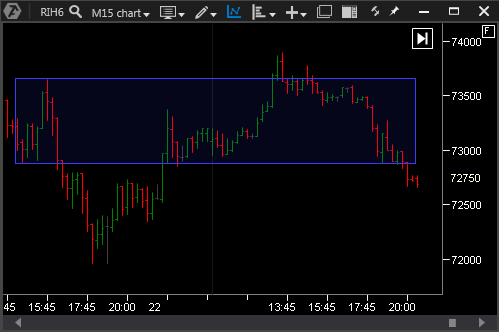 To build the line, select the desired area ofthe chart and left-click. Then, a horizontal line will appear on the chart. 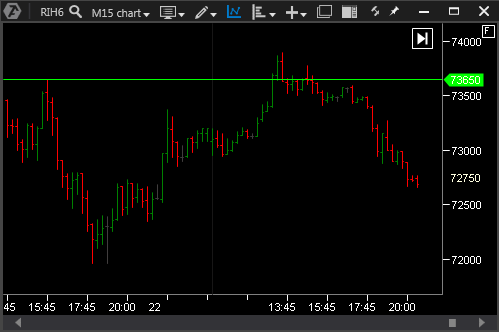 The price level of building the line can be specified in visual settings of the horizontal line. Also, an alert can be set on the required distance from the price (i.e. 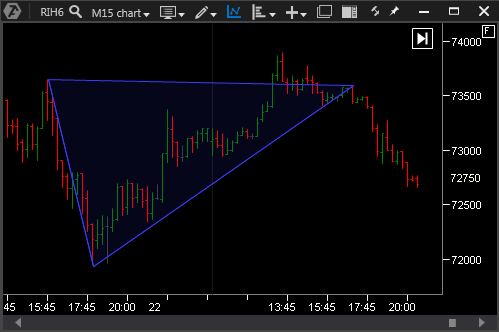 when the price is at this distance to the line, an alert will sound). In addition to the sound alert, a text notification about the event will also be displayed in the Alerts window of the Open menu. Moreover, an inscription above the specific line can be made. The sequence of Fibonacci numbers is very well combined with the levels of asset price correction in the markets after the growth and can also predict the possible price movement after the correction. To build, select the desired area of the chart, left-click on it once, stretch to the desired mark, and left-click again (on the endpoint). 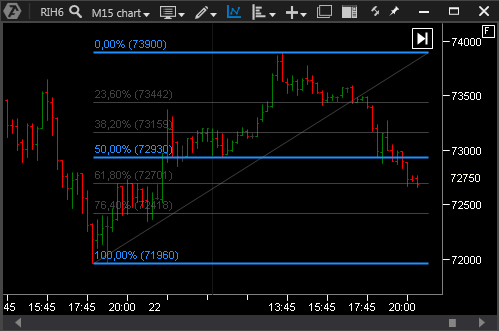 The Fibonacci levels will appear on the chart. * It is possible to adjust the levels and the display of values at these levels. Percentage, % - this option configures the display of the level as a percentage. This instrument allows measuring the distance traveled by the price, number of bars, time, volume, and delta for the selected interval on the chart. 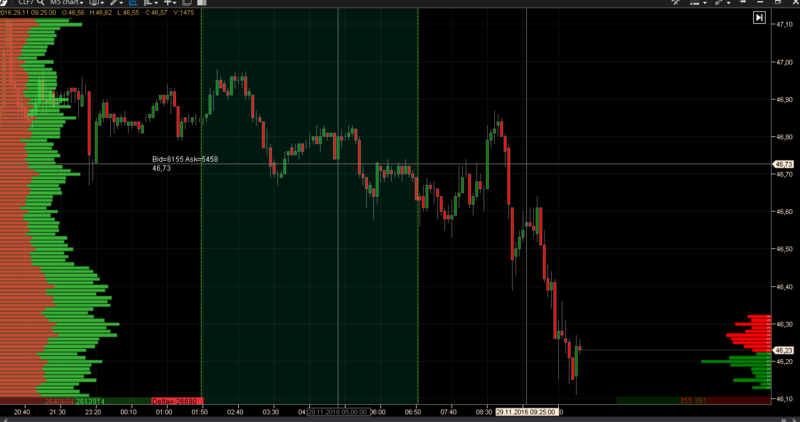 To build it, left-click the initial point on the chart and click again in the endpoint. This will open an information window, which we can move to an appropriate location on the chart and left-click on it again to pin it. It is required to highlight different areas of the chart. To build it, left-click on the desired area on the chart and move the mouse cursor to the first point; then left-click and move the mouse cursor to the second point.To complete the drawing of the object, left-click again.After that, the object will be displayed on the chart. * The transparency of the triangle background can be adjusted in visual settings. To build it, left-click on point 1 on the chart and drag the cursor to point 2 without releasing the mouse button; then click again to complete the construction. * The transparency of the rectangle background can be adjusted in visual settings. 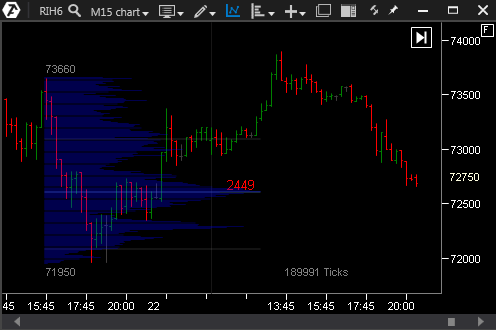 This is a horizontal bar chart that shows the distribution of the volume/trades/time/delta at the price for a certain period of time. To build it, left-click on point 1 on the chart and drag the cursor to point 2 without releasing the mouse button; then click again to complete the rectangle. Let us consider the settings of this object. Full Lines - bars that fall within the filter value, will be extended to the entire area of the object. Maximum - setting the display of maximum volume in the profile. Minimum -minimum volume setting display in the profile. Extend Lines - Activation of this function extends the max level line. Max.Level Color - color adjustment line max level. Show Maximum Level Text - color adjustment line max level. Text Color - text color setting max level. Transparency - setting the transparency level of the line max. Area Color - color adjustment profile background. Area Transparency - setting transparent background profile. Behind the chart - Profile display the background graphic. Profile Color - color profile setting. Profile Transparency - profile setting transparency. Realtime Mode - when you turn on this option, the profile will be formed in real time. Show Comulative Values - It displays the total number of cycles in the profile. Show High Low Prise - including display high / low price profile. Show Text - the inclusion of the text in the profile. Text Color - color adjustment of the text in the profile. Width Factor - setting the width of the profile with respect to a selected section of the chart. Color - color lines setup Value Area. Show Value Area - including display line profile Value Area. Value Area Transparency - Transparency setting of lines Value Area. 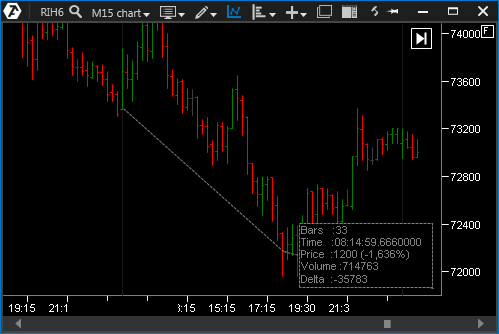 -- Open menu on the graphic panel and in the window that opens, in Chart Markets select the desired item. -- With the help of hot keys. Edit each of the elements begins with the selection, it is necessary to click on an item once with the left mouse button. Each of the elements can be moved to any point on the chart. To display text on the chart, use one of the embodiments described above, and then click the left mouse button on the chart. Next, the pop-up settings window, in the string Text, Enter the text you want, then click OK. This element plotted to the chart and it has the same configuration as the Text. *Разница между текстом и надписью заключается в том, что текст привязывается к самому графику, а надпись к конкретной области на графике, т.е. при перемещении цены текст будет перемещаться вместе с графиком, а надпись при этом будет оставаться на месте. * The difference between text and label is bound to the text to chart, but to label a particular area on the chart, i.e. 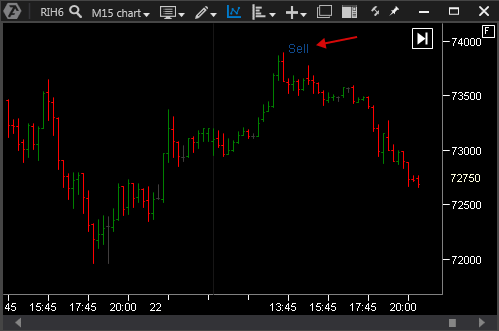 when you move text prices will move together with the chart, and label at the same time will remain in place. 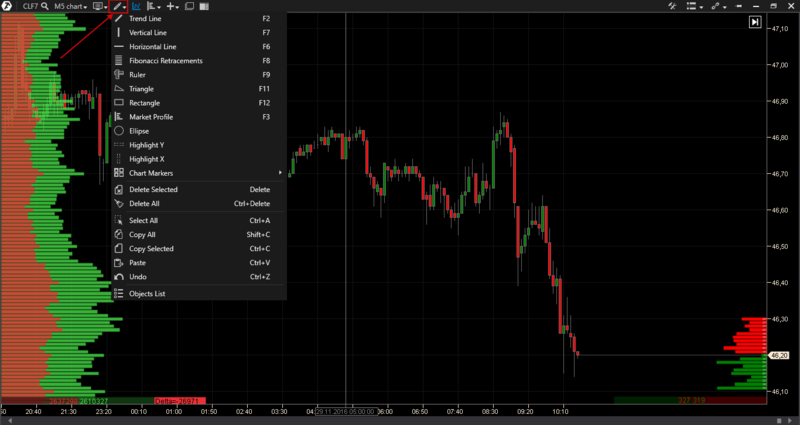 To insert an element, click on an area of the chart left mouse button, then the element will be displayed on the chart.